The Florence vital™ 1570 series cluster box unit design has been adopted by the USPS as the design standard for all CBUs manufactured in the United States. The USPS began to officially license this new standard in 2007 – now manufacturers must be approved AND licensed in order to manufacture the CBU. As the original manufacturer of the F Series, Florence is pleased to offer a complete line of USPS approved cluster box units to fit your individual project needs. We are honored to have been selected as the sole supplier of CBUs to the USPS and proud to offer you the same security and reliability that the USPS depends on every day. The Florence vigilant™ 1565 series high security cluster box unit was designed specifically for the U.S. Postal Inspection Service. 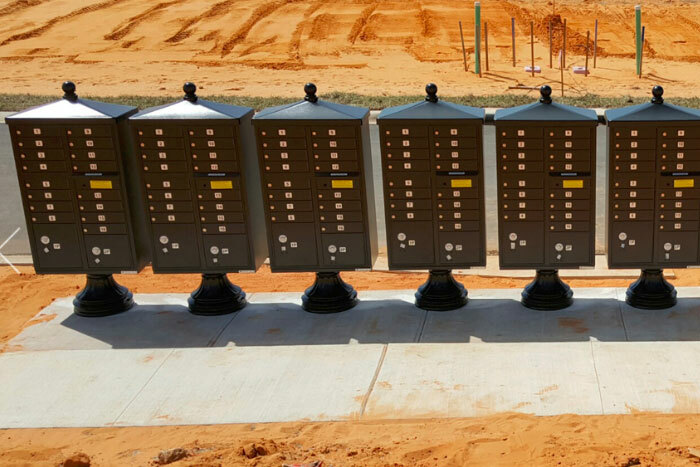 Built to combat mail theft and reduce break-in damage in high crime areas, its robust security features make the vigilant™ HSCBU incredibly secure. This product line is an extension of our already strong vital™ CBU series with the benefit of additional tamper resistant features. Give your neighborhood that extra peace of mind by adding a Florence vigilant™ CBU. Want to dress up your vital™ CBU? Florence Corporation is pleased to offer USPS Approved designer cluster box caps and pedestals. These fashionable snap-together accessories place the final touches on your centralized neighborhood mailbox while adding extra protection to your investment.